Workers in the Avonmouth area are celebrating the launch of a new shuttle bus service to help them commute to their place of employment. 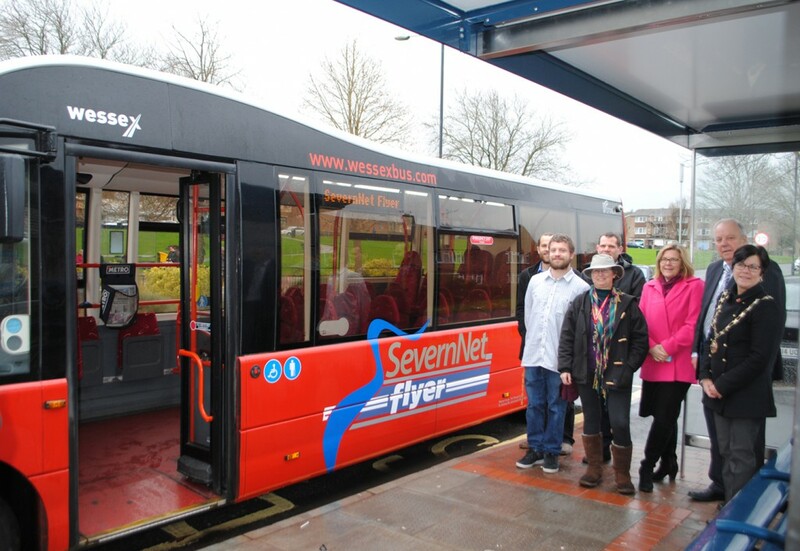 The SevernNet Flyer shuttle bus has just started operating in the Avonmouth Severnside Enterprise Area and for a limited time people working locally can travel on the service for free. The shuttle bus is operated by Wessex Bus seven days a week, connecting Avonmouth Rail Station, Avonmouth, Shirehampton and Lawrence Weston with Avonmouth Industrial Area. It will link businesses with the main transport connections and local residential areas, aiming to help car sharers and non-drivers access their workplaces. Workers can travel for free on the shuttle bus until the end of March. From 1 April the fare will be just £1 per journey with reduced rates available for multiple journey tickets and travel cards. Chair of South Gloucestershire Council Cllr Erica Williams and Planning Transport & Strategic Environment Chair Cllr Colin Hunt joined members of SevernNet Working who make up the Coastal Communities Team and Wessex Bus staff on Wednesday 27 January to officially mark the launch of the service. Cllr Hunt said: “We’re really pleased to see this new shuttle bus service get off the ground to help people get to and from their place of work in the Avonmouth area, and for a limited time workers can travel for free. This is one of a range of initiatives that the SevernNet Working Coastal Communities Fund project will deliver to benefit the Avonmouth Severnside Enterprise Area. The project has also established hubs to provide employment and enterprise support for people struggling to get back into work or with aspirations for running their own business (eighty people have already been helped by the hubs, with 24 of these already gaining employment). It will additionally improve the cycling infrastructure between the A4 Portway Park and Ride and Cabot Park via St. Andrews Road. The project has been funded by £1.2 million from the government’s Coastal Communities Fund.